Yet another battalion finished for the Vimy Project; 3rd (Toronto) Battalion, Canadian Expeditionary Force, which was also part of the 1st Brigade, 1st Canadian Division. 3rd (Toronto) Battalion, Canadian Expeditionary Force. The formation patch for the 3rd Battalion was a green triangle surmounting a red patch – the red patch was for the 1st Division, the triangle was for the third battalion within the brigade and the green was the senior brigade within the division. Another battalion finished for the Vimy Project; 2nd (Eastern Ontario) Battalion, Canadian Expeditionary Force, also part of the 1st Brigade, 1st Canadian Division. 2nd (Eastern Ontario) Battalion, Canadian Expeditionary Force. The formation patch for the 2nd Battalion was a green semicircle surmounting a red patch – the red patch was for the 1st Division, the semicircle was for the second battalion within the brigade and the green was the senior brigade within the division. 3rd (Toronto) Battalion, CEF? Let’s hope so!! Here, finally, is the next battalion finished for the Vimy Project; 1st (Western Ontario) Battalion, Canadian Expeditionary Force, part of the 1st Brigade, 1st Canadian Division. 1st (Western Ontario) Battalion, Canadian Expeditionary Force. The formation patch for the 1st Battalion was a green circle surmounting a red patch – the red patch was for the 1st Division, the circle was the for the senior battalion within the brigade and the green was the senior brigade within the division. 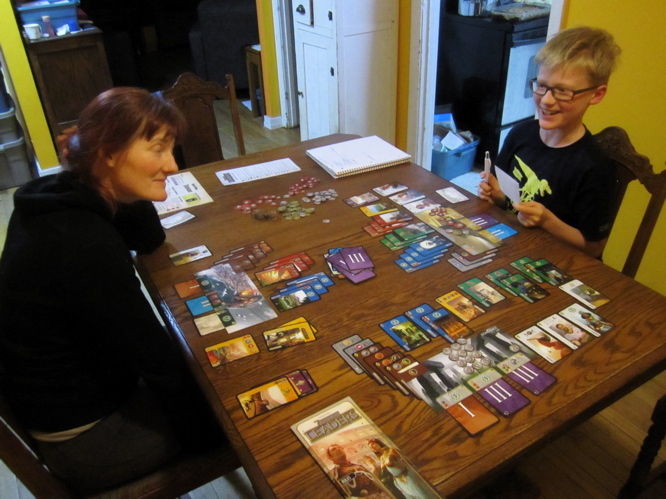 Yesterday, after our game of Twilight Imperium, Amanda, The Boy, and myself sat down to play a couple games of 7 Wonders (with Leaders). I’d had two leaders that dealt with blue cards (civic structures) – one gave me and exptra victory point for each blue card and another allowed me to place one with one less resource available (which, in the end, only helped me place two cards – the rest I got because they were free or I had a previous card that allowed me to place it without paying). I thought The Boy was going to crush it with all the green (Science!) cards he grabbed. In the end I won (by one point) and I was only able to do so because on the very last round of the 3rd age I placed a military card – in a game where NO ONE had gone for ANY military – which gained me 10 points (and lost them one each). I ended up with 67 points, Amanda 66 and The Boy somehow trailed behind at 48?! 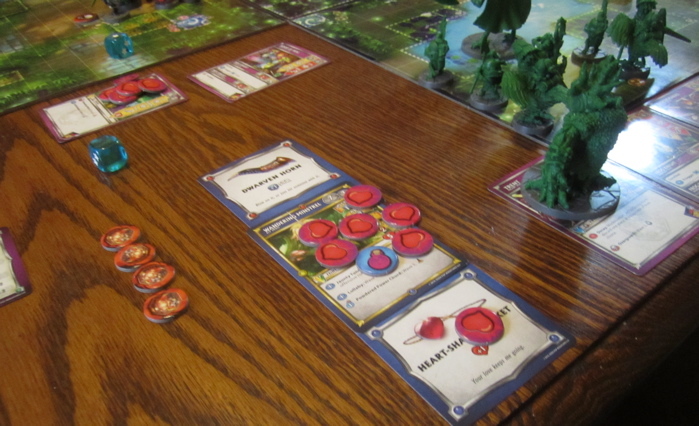 In the second game I was excited because I got to play Wil. I ended up with a mish-mash of stuff that seemed like none were giving me a LOT of points. Amanda also felt she hadn’t done very well. 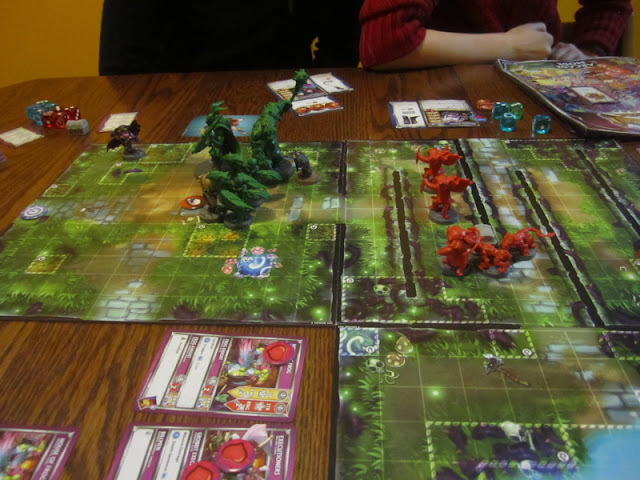 When we totaled it up we hadn’t done quite as well as the previous game – we both scored 57 points – and The Boys scored 56!? Can you get a closer game? (I guess if it’d been a three way tie that would have been closer). 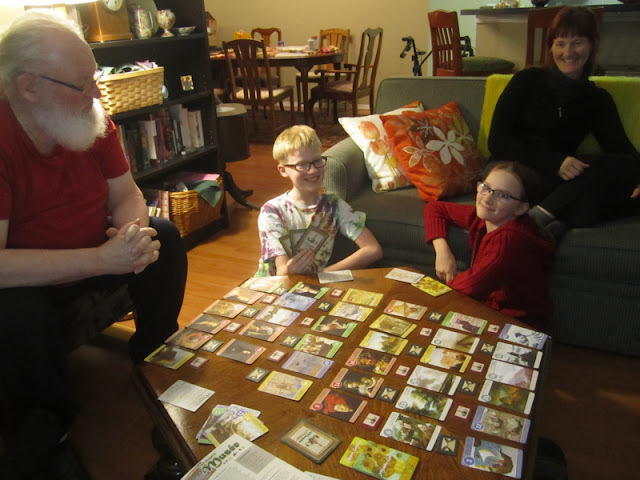 During the leader selection phase at the beginning of the game I’d passed on Plato and then kicked myself when Amanda passed me Justinian – as they both gain victory points for similar things (collecting sets of different cards). I ended up passing on Justinian and hoped The Boy didn’t end up with both. He did and I thought he was going to crush us as he collected up sets of stuff, but it didn’t do so well as collecting sets of sciencey things, as I was trying to do, or Military victories, as Amanda was going. This was fun, and a bit different as the last few games I've played of seven wonders have been bigger 5-6-7 player games. I think I like the bigger games better, but this was still a lot of fun. 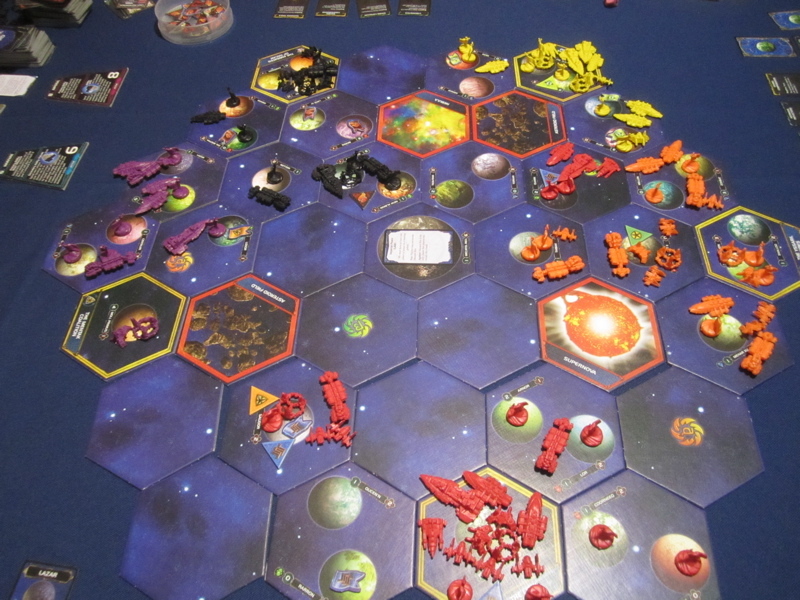 I finally got to try out Twilight Imperium (Third Edition). 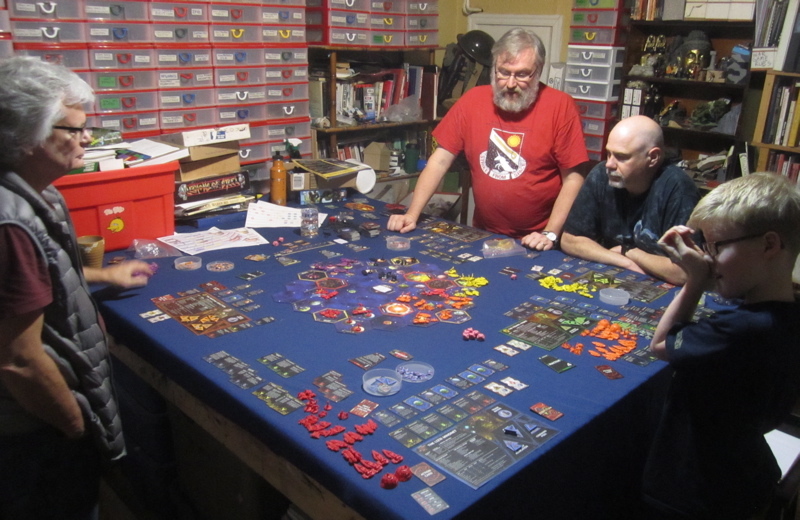 My friend John brought his copy over to set up and play through a few turns - just to teach the game Rob, Bob, The Boy and myself. We'll have to set aside a whole day some time to get through a complete game. I really like the game - there's a LOT going on in it and it seemed a little overwhelming at first. by the time we were done playing I felt like I more or less had the basic mechanics figured out, I'm feeling like the strategy was still a bit beyond me at this point. I was red. Because red make you go faster! (not really). I kind of goofed up my last turn because I was somehow mistakenly under the impression that a law we had passed the previous turn was only valid for THAT TURN ONLY (not suggesting that was anyone's fault but my own, just sayin'). By the time I'd realized my mistake we'd already selected Strategies for the turn... Ah well, the game was all about learning. Now we just need to set up a game before I FORGET everything I learned today! In other news - I did finish up the 1st battalion last night and just need to put some grassy clumps on teh bases and should have pictures up tomorrow. No, not the 1st (Western Ontario) Battalion as promised – I have been working on them. I just happened to also be working on these concurrently and sort of finished them off first. 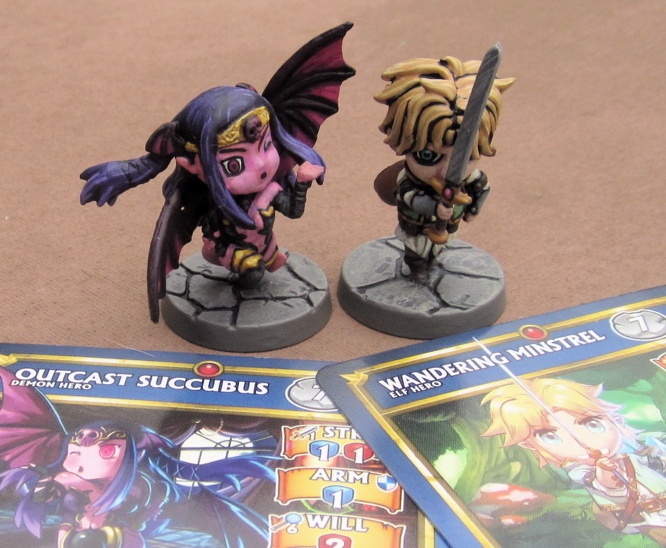 All the figures in this post are from Gripping Beast/Woodbine Designs. Two Canadian officers. The one with the red brassard is from the 2nd Division HQ, the other is from the 5th Brigade HQ. 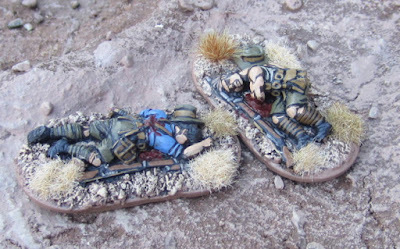 A couple of 2nd Division casualties. This figure is supposed to be another Australian casualty, but I painted it in such a was as to pass it off as a Great War Gurkha. 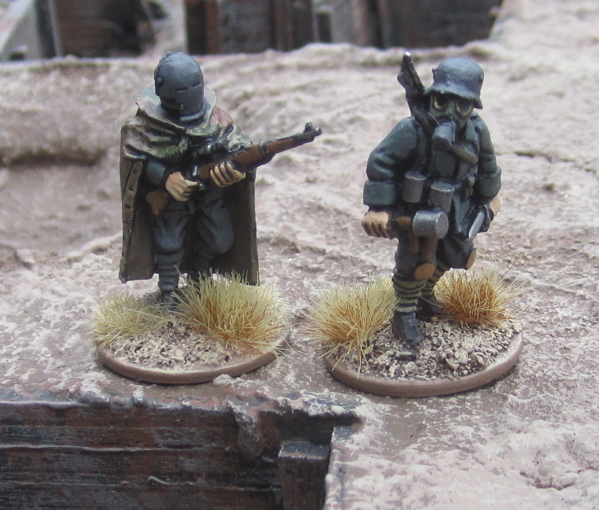 Two German machine-gun teams from Great War Miniatures. 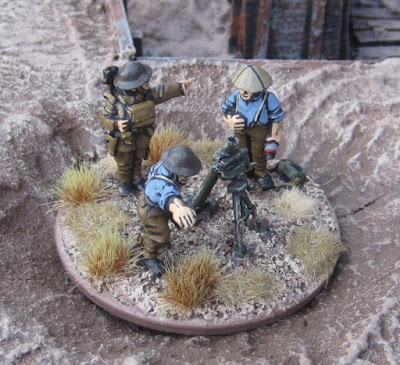 Have I mentioned lately that I love Great War Miniatures. I do. They are lovely models with such fun details. the team on the right must be veterans as they still have their older uniforms that still have piping. Canadian trench mortar team that seems to be in some disagreement on where they should be firing…? Model is from 1st Corps. This is a small force from the Army of British India I have cobbled together for The Men Who Would Be Kings. 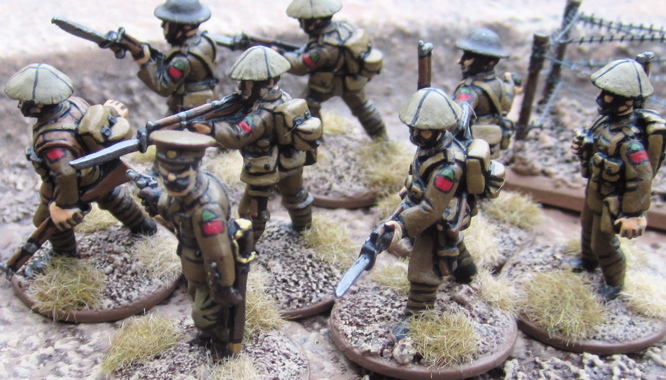 Most of the figures – the Gurkhas and Indians and their officers – I painted nearly 30 years ago. 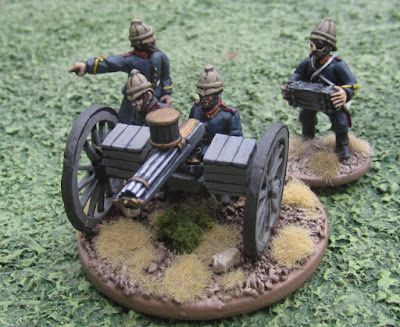 They were on 20mmx2mm card bases until a few years ago when I rebased them onto MDF multi-figure bases to make them into a DBA/HOTT force, and now I’ve rebased them to fit with all my other individually-based 19th century stuff. Conveniently there are just enough of them to make a Field Force for The Men Who Would Be Kings! Unfortunately I don’t really have any OPPONENTS for them… But they’re ready for action for whenever I do happen to put something together. Most of the figures were from Ral Partha, the exceptions being the Highlanders (who were mostly made by my friend John and lead by and officer and Piper from Minifigs) and the Gurkha officer, which is from Rafm. 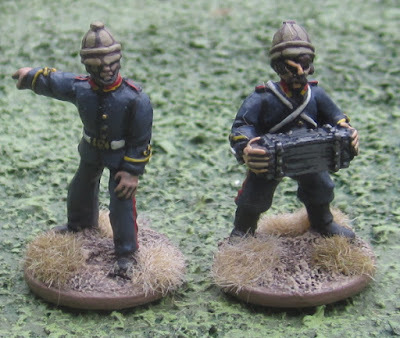 I know, I know... the British officers probably should have uniforms that match the forces they are leading… I wasn’t so concerned with such details 30 years ago, and I can’t bothered to repaint them at this point. I’d like to make the Gurkhas (and maybe the Highlanders) “Fierce” to do this I could either downgrade the Indian and Gurkha units to “Poorly Armed” or downgrade the Gun to “Poorly Drilled”. There’s also a “Gurkha” special rule that allows them to move through difficult terrain without being slowed down, but that’s also a +1 point upgrade… I suppose I could downgrade the gun to “Poorly Drilled” and the Gurkhas to “Poorly Armed” to add that in as well…? I guess I don’t have to worry about this until I actually have someone for them to fight… Things to consider, though. Some machine-guns and mortars, then the 1st (Western Ontario) Battalion, Canadian Expeditionary Force. Just clearing a few things off my workbench that were mostly done before taking stock of where things were at for the Vimy Project the other day. 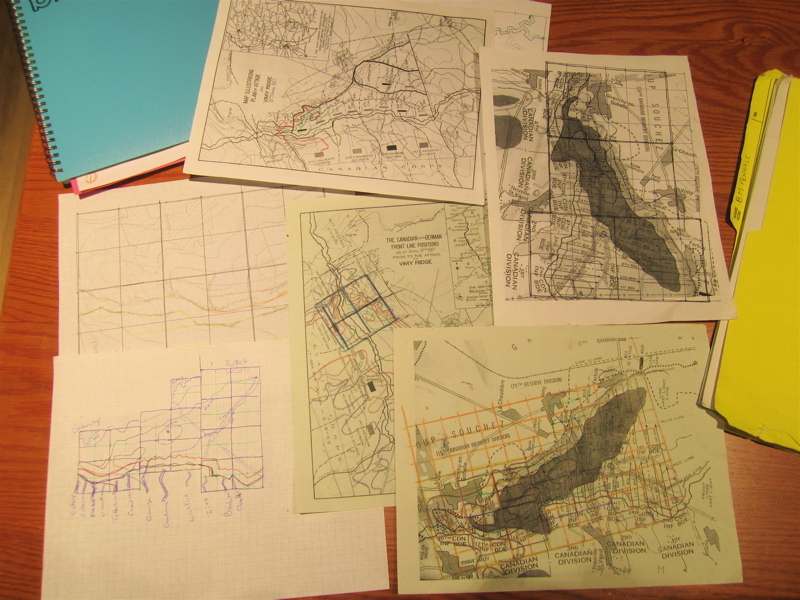 Since then I’ve decided I’m going to hold off on working on the terrain for a few weeks to do a bit more research. 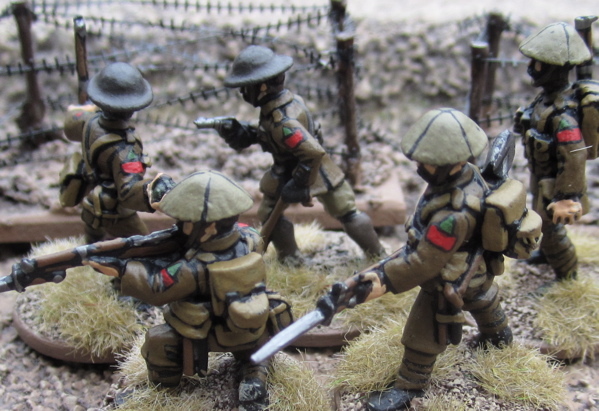 But I do have the next Canadian battalion on the workbench – they will be the 1st (Western Ontario) Battalion. The whole of the First Brigade were from Ontario – the other battalions being from Eastern Ontario, Central Ontario, and Toronto. All of the figures are form Wargames Foundry. A German Sniper and Stormtrooper from Great War Miniatures. 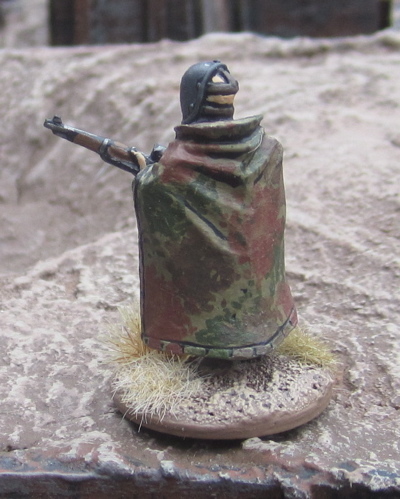 Back of the sniper – to show off his camouflaged cape. Two more snipers – also from Great War Miniatures. Detail of their other sides. Two colonial British artillerymen. I think the chap carrying the ammo crate is from Wargames Foundry the officer is from Black Tree Design. I painted these to add to some existing (previously painted) gun crews as the number of dice rolled for guns in The Men Who Would Be Kings is based on how many figures are left in the unit. Technically, if I’m increasing all the unit sizes by 25% (as I was planning to do), I should have FIVE gunners… I guess I’ll have to find another I can add to the team! On With the Vimy Project! With ToonCon and REGINA TRENCH! out of the way it’s time to get cracking on the Vimy Project once again, So I thought I’d just post a quick update on the state of the project – as much to remind myself what still needs to be done as any of you our there in bloggerland. I have 19 weeks until the Winter Wargaming Weekend/birthday Bash and 25 weeks until the big show on the 100th anniversary of the battle – 9 April 2017. I have between 19 and 23 battalions of British Canadians to finish before then… There are 19 battalions I need to finish the Canadian Corps – but 4 of them did not participate in the battle on 9 April 1917 – the 10th Brigade was being held in reserve to assault The Pimple – a redoubt just nort of the ridge – on the following day. So I don’t REALLY need to have them painted for the game… There are four battalions of British that were attached to the Canadains on the 9th, however, that I should get done. There are between 9 and 12 battalions of German infantry I need to cast and paint up as well. Sooooo… no more Zulus (or any other distractions, for that matter!) until next may!! (Although I probably will try to get in a few games of The Men Who Would Be Kings with stuff that I already have). I can say this weekend I resumed work on the Vimy terrain. 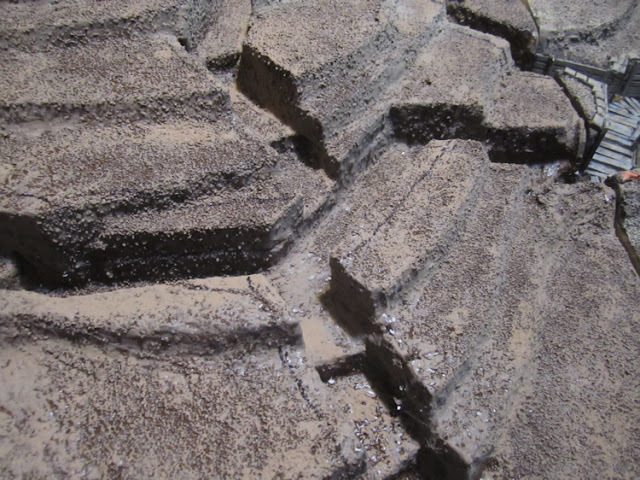 I am starting with refurbishing the original terrain for the 4th Division that I started building almost 10 years ago. 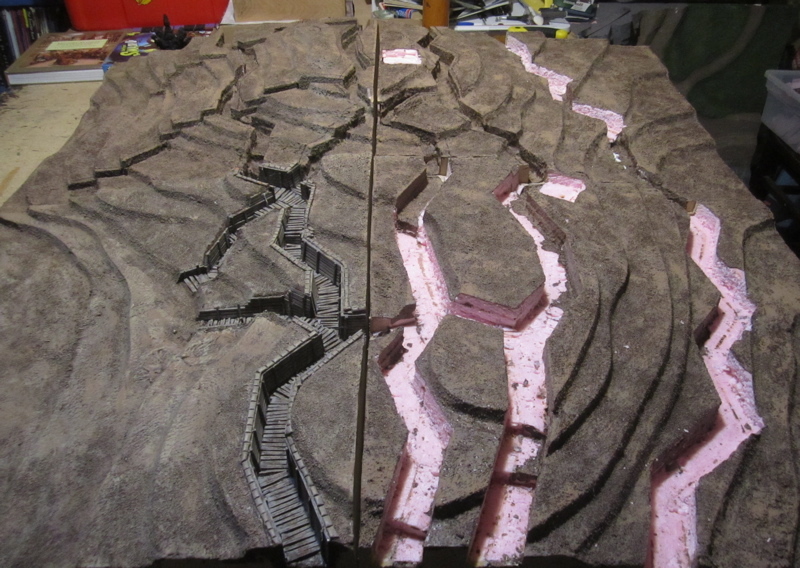 A little over four years ago I started refurbishing the terrain (as the original terrain was a bit rushed and I didn’t get to doing all the details in the trenches I’d originally intended (revetting, duck boards, sandbag parapets, etc). 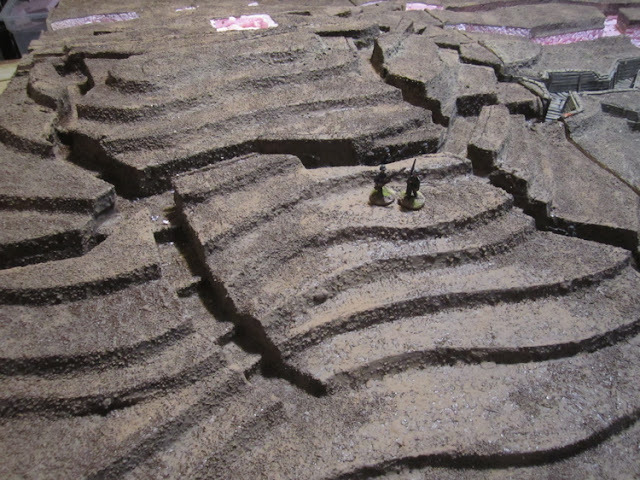 Also the original trenches were a lot narrower (as I’d made them for miniatures originally based on smaller bases than my current miniatures are! I have three (of the four) terrain block to refurbish and a dozen more, or so, to build from scratch. The Fourth Division's terrain - at the north end of the Ridge - with parts that I previously refurbished (bottom left), parts I'm just cutting into (mostly on the right) and stuff I haven't gotten to (everywhere else). 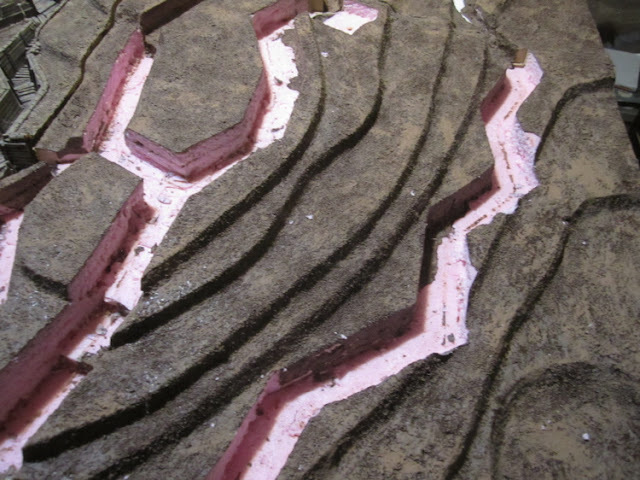 Parts of the Nothern half of the Fourth Division terrain - including the parts I previously refurbished. Northwest corner of the Fourth Division Terrain where I've don most of the cutting so far. What a mess. The Southeast corner of the Fourth Division terrain - with a few figures thrown in for scale. Haven't done any cutting here just yet - so you can see the terrain pretty much as it was. 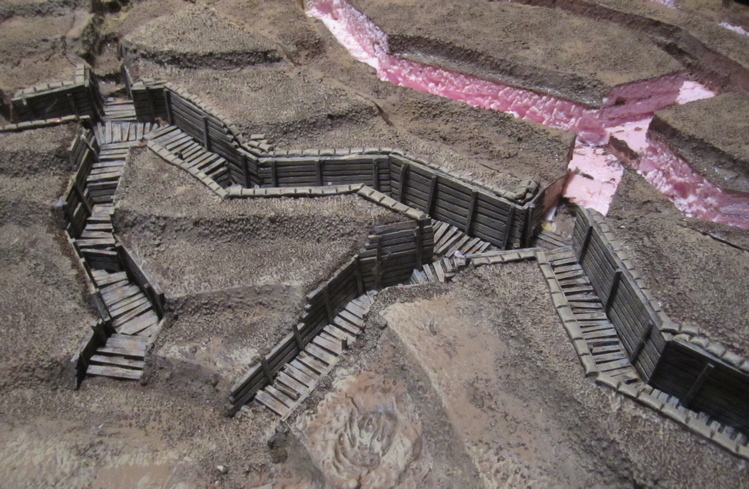 Detail of the old trenches as they are (with a few markings where I'm planning to cut). In the process of making this mess, however, I got to realizing I hadn’t included any support or communication trenches on the Canadian side. 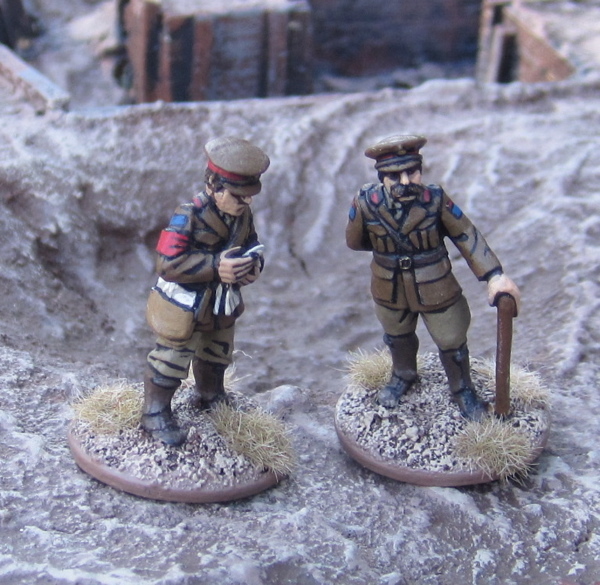 In game terms they weren’t really necessary – and most of the support trenches wouldn’t fit on the planned are of terrain – but I got to wondering if I should at least add in some communication trenches while I’m at it? This also led me to wondering if I should include all of the subways that were build to help bring troops and supplies forward for the assault – safe and out of sight of the Germans on the ridge! If so, how should I depict them – just model the subway exit points in the front line? 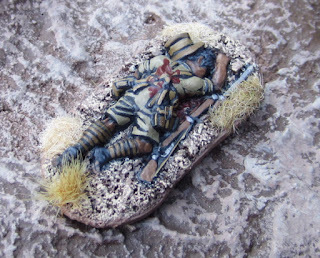 Or should I make underground subways (with removable tops) that we can store all the second wave troops in until after the first wave troops have left the frontline trenches!? What about forward command posts for the brigade staff I’ve been painting? Should I do the same on the other side – have command posts on the other side for Regimental staff? I have no idea where these would have actually been historically and no idea where to start looking. So do I bother? Or just put some in for fun in a reasonable/likely place? I also need to make some more Barrage Markers. Oh and I’m going to need to make a whole lot MORE Barbed Wire! This would leave March to finish up anything not quite finished up and to make barrage markers and wire and measuring sticks and maps and divisional/brigade order sheets, etc. Oh yeah… and somewhere along the line I’ll need to recruit some more players… If I had one player per Canadian Brigade (each commanding 4 battalions) and four “helpers” to run the Germans, I’ll need 16 participants. 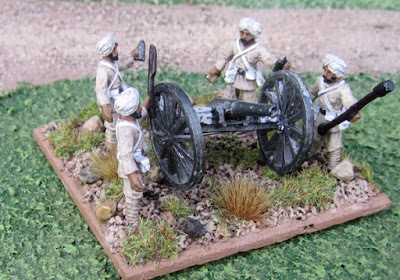 Not Zulus… Great War Stuff!! Another break from the Great War to finish up two more units for my Zulu force for The Men Who Would Be Kings. These were largely done because a) I’d really like to try out The Men Who Would Be Kings and b) these were pretty low hanging fruit – in that I painted four small groups of five to finish up four 20-figure units! Unfortunately this doesn’t COMPLETE a 24-point force… so now what…? 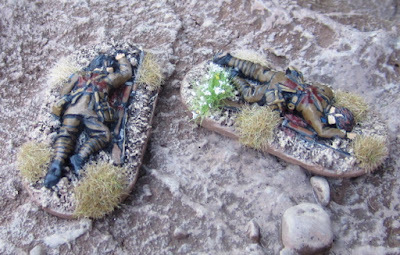 To finish the force I need to paint up two more units – of 20 figures each! 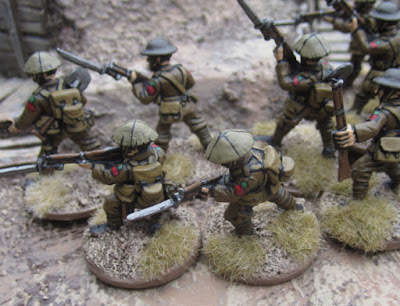 I do have enough British done for a 24-point field force already done. 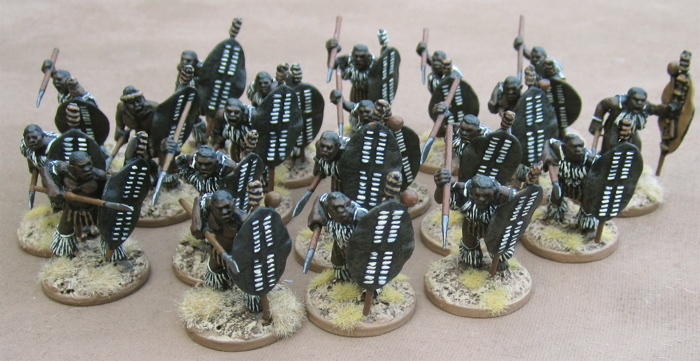 The recently painted chaps – more unmarried Zulus from Wargames Foundry. 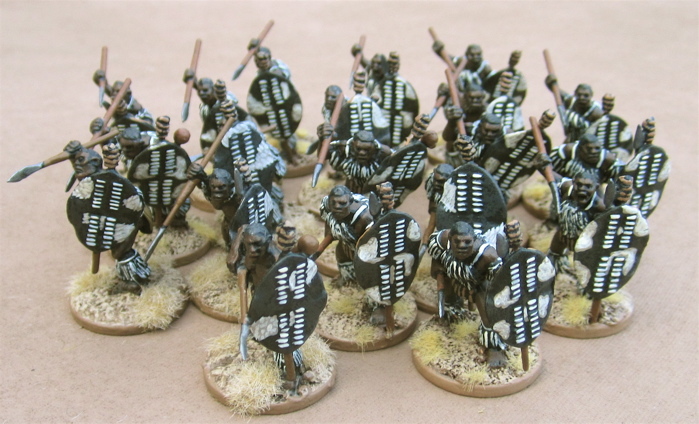 I’m going to need to get around to painting some MARRIED Zulus at some point! The other unit finished up by this lot. The entire force – so far… with the two units of zulus with pilfered firearms it could be fielded as a 24-point Field Force! I have another unmarried unit sitting one the workbench (because all the unmarried Zulus require manufacturing spear and then gluing them on along with shields – the unmarried ones are assembled, primed, and ready to go (again with the low-hanging fruit!). Or perhaps I'll just play a few games with the two units of musket armed Zulus and get back to doing Great War stuff!! 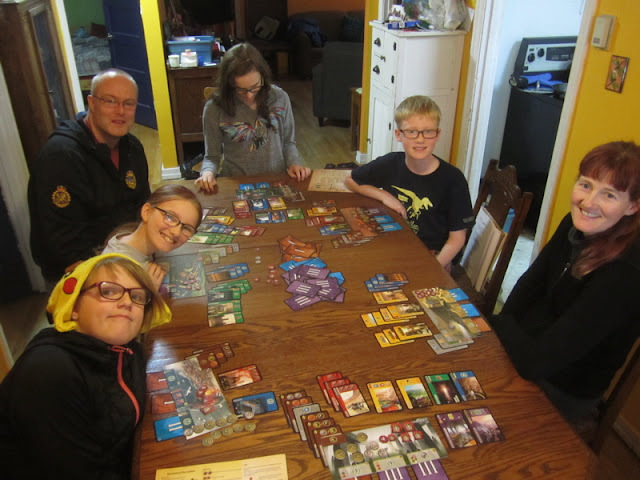 This past weekend was Thanksgiving (here in Canada, at least…) and we had a bit of an blast of winter-like weather earlier in the week, so we mostly stayed in and played games all weekend. 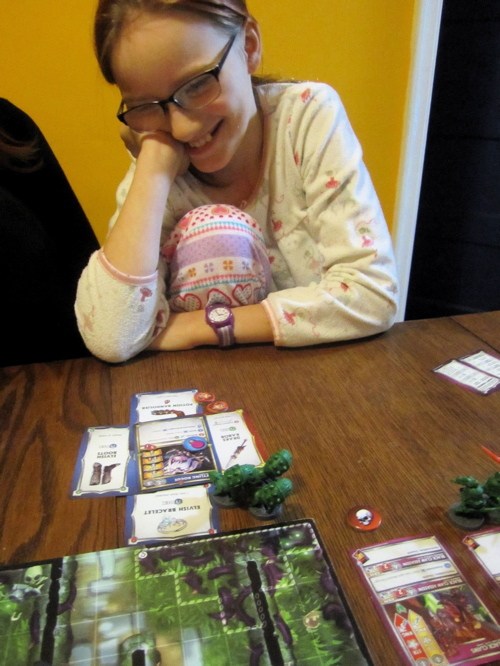 Friday night Amanda and I played our regular Friday night role-playing game – currently we’re playing in a D&D 5E Primeval Thule campaign. 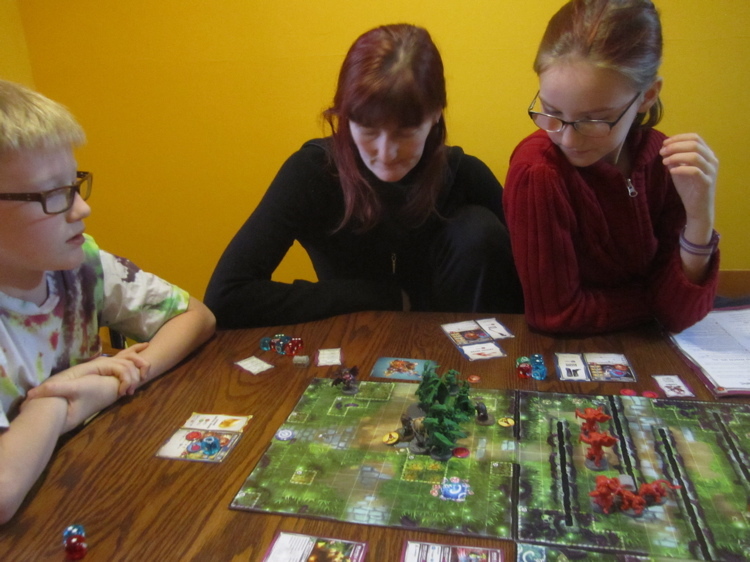 Saturday afternoon we played Firefly: The Board Game which I already posted about. Saturday evening we played host to ANOTHER D&D 5E game – but this time it was the group that The Boy plays with every other week at King Me Boardgamery - and Amanda and I hid in the basement and started watching The Walking Dead season six (which I’d pick up from the library that morning). 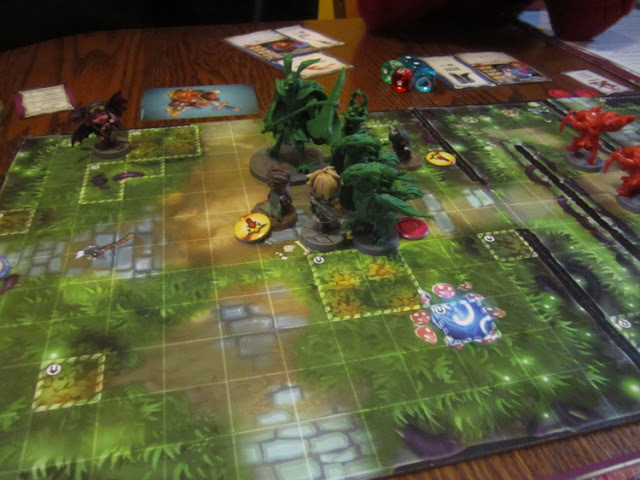 So The Girl set up a game for us to play in “Arcade Mode” – which is basically a co-op game where the dungeon monsters follow an A.I. 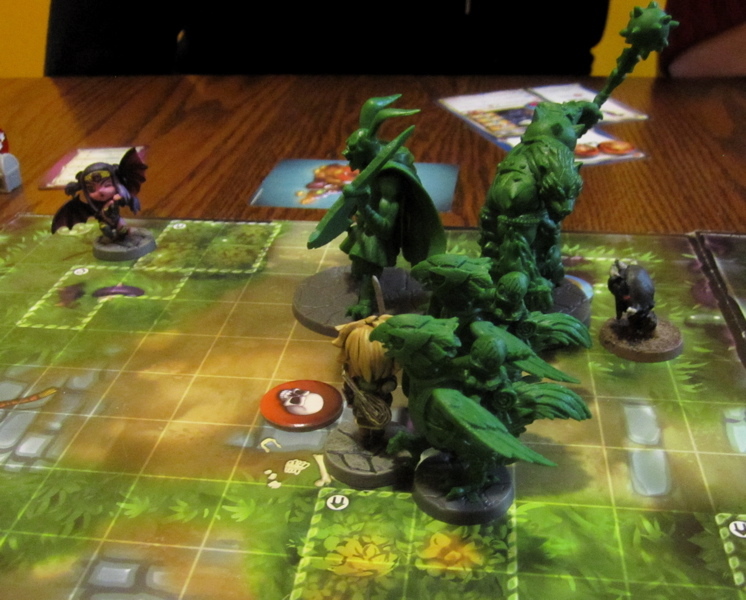 She included some of the baddies from the Claws of the Wyrm Warband she’s also picked up. The Characters for our adventure. Amanda and I played the minstrel and the Succubus, The Boy played The Royal Paladin and The Girl played The Riftling Rogue (both of which were painted by The Girl - so far she's only managed to paint a few of the Heroes - but after playing this hopefully she'll be motivated to paintup some of the others)… so both girls were playing demonic women…?! It took some time to puzzle through the rules. The Girl is the only one who has actually READ them. Usually I read the rules and explain them to everyone, but I thought since it’s her game she should try. She tried her best, but she is only ten and, while she can play all sorts of games when the rules are explained to her, reading rules on your own and explaining them to others is a whole different kettle of fish. We made quite a few mistakes… with both the A.I. 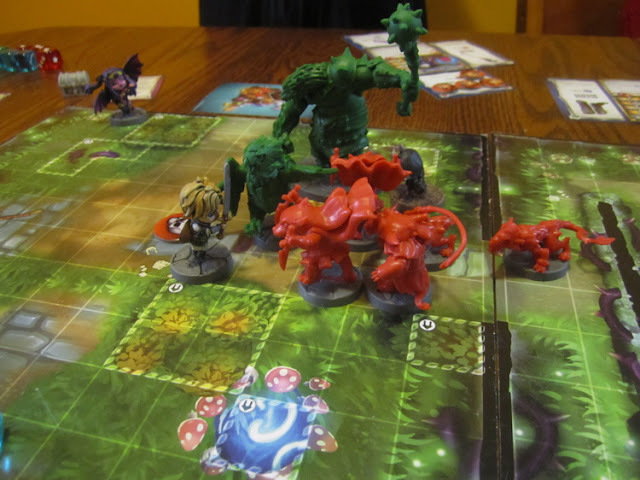 controlling the monsters and how the player actions worked. The Girl thought that the monstes would only attack the player with the most “Wrath” (you get wrath tokens for doing stuff against the monsters) when actually they only move towards the character with the most wrath, but will attack anyone at had wherever they end their movement. 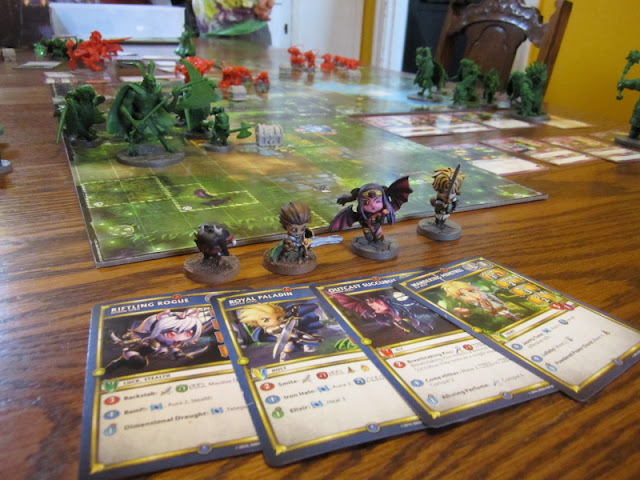 The Girl had also thought we had to do all our movement first THEN spend actions – when actually we could have spent movement and action points in any order – which would mean a LOT more options for moving about the board and doing stuff. Things not looking great for us. That’s me pretty much standing along against all the stuff on the first section… The girl wasn’t being touched because she had no wrath points. (actually she should have been taking hits too… ah, well… it was our “figuring stuff out” game). 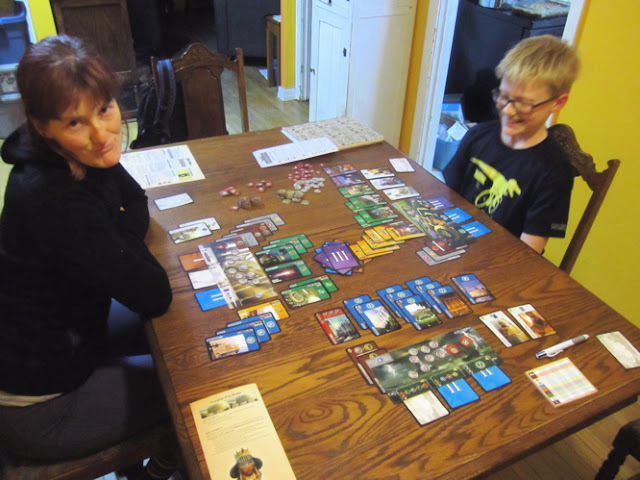 And then I got beat down by one of the “mini-bosses”…. 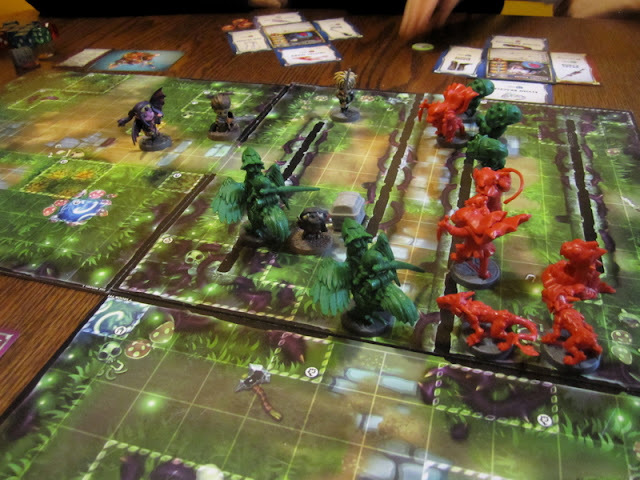 Later we came back home and played some more Super Dungeon Explore. The Boy and I were restored to life. 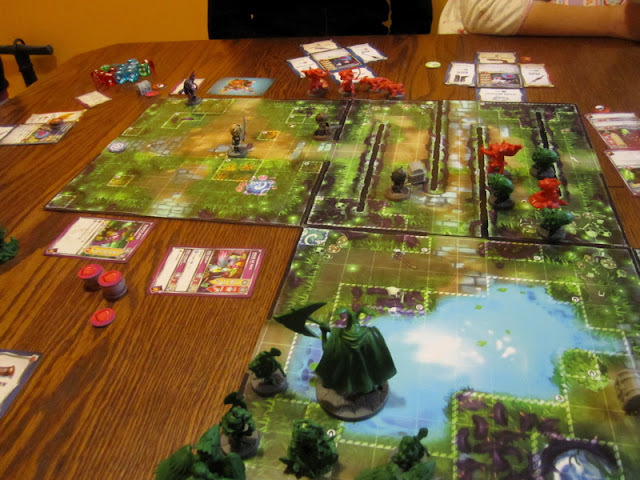 We almost managed to clear out the second board…. Seriously, there’re these squirrel like things that move around and when they get in contact with you they are removed from the board and put on your card – because they are, literally, in your pants – and they can only be attacked by you and until removed they lower your armour – or something like that…? Sunday one of my oldest and dearest friends came over with his girls to play some games for the afternoon. I haven’t seen them in a long time - so it was great just to see them and even more fun to play a bunch of games with them. 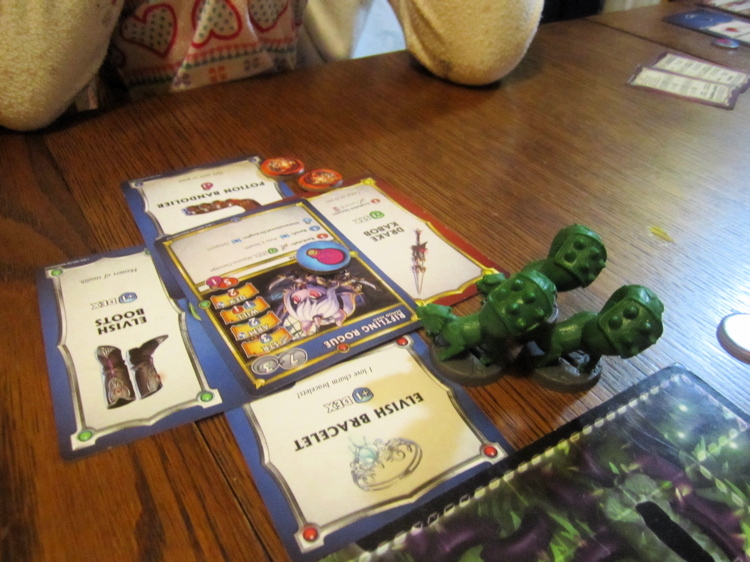 We started out with a game of Monty Python Fluxx. 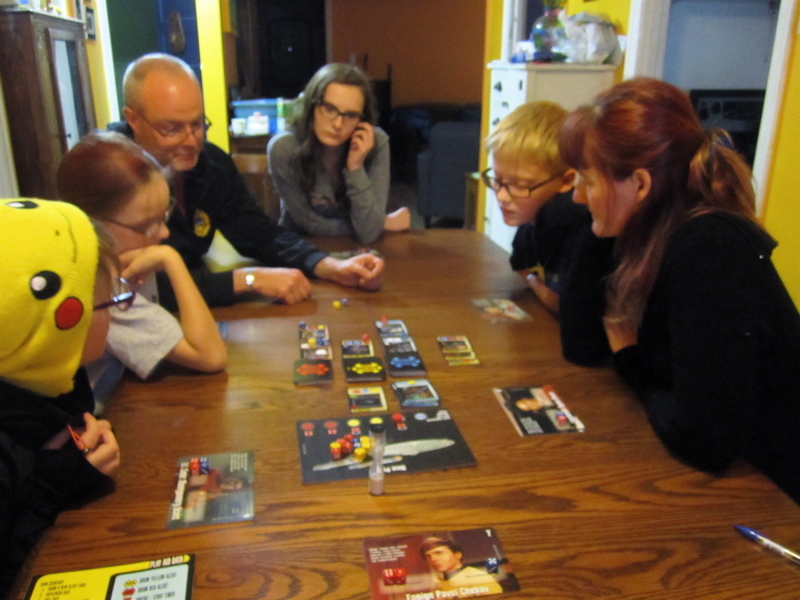 After that we got to try out a seven-player game of Star Trek: Five Year Mission - and we WON!! (though it was a pretty near thing a couple of times!) I played Chekov. 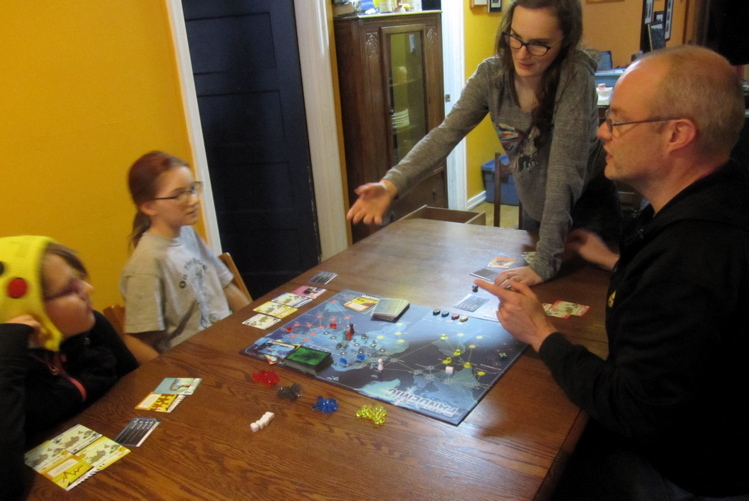 And then The Girl played a game of Pandemic with them. 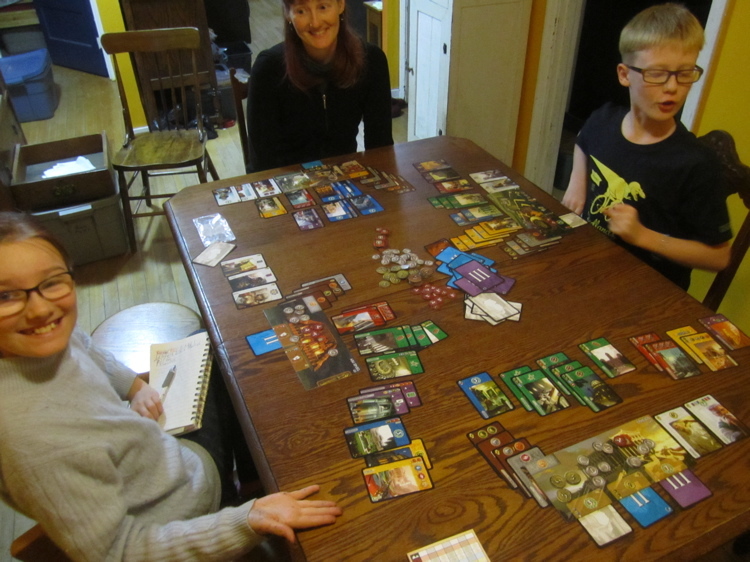 After they’d left and we’d all had supper, everyone seemed to decide they’d had so much fun playing 7 Wonders that we should do it again!? So we did – and added in the 7 Wonders: Leaders expansion. It's supposed to warm up a bit over the next few days - hopefully enough to melt the rest of the snow so we can get the carrots and potatoes out of the garden before it snows again!